Anyone interested in cosmology will find this book an indispensable addition to their library and learning. From the ancient Vedas comes surprisingly accurate cosmological information. The universe as described in such Indian texts as the Bhagavatam seems strikingly different from the universe of modern astronomy. This book addresses this apparent conflict in detail, and outlines a systematic approach to understanding the ancient viewpoint. Topics include the celestial geometry of Bhu-mandala, mystic powers, higher-dimensional realms, Vedic mathematical astronomy, space travel, the moon flight, astrophysical anomalies, the dating of Kali-yuga, and more. Before making a truly radical departure from our familiar conceptions, we will begin by discussing some relatively moderate instances in which the Vedic literature refers to phenomena and theoretical ideas that do not fit into the current framework of scientific thought. These examples illustrate two main points: (1) Although many Vedic ideas contradict current scientific thinking, they also allow for the possibility that the contradictions can be alleviated by extending the conceptual scope of modern science. (2) Many ideas relevant to our physical world-picture are alluded to only briefly in works such as the Srimad-Bhagavatam, since these works were not intended to serve as textbooks of astronomy or physical science. Thus the conceptual advances needed to reconcile the Vedic world view with modern science may be difficult to make, since they require ideas that radically extend current theories but are not explicitly spelled out in available Vedic texts. Our first example is found in Bhag. 3.26.34p. There we read that the ethereal element provides a substrate for the production of subtle forms by the mind, and that it is also involved in the circulation of vital air within the body. Srila Prabhupada indicates that “this verse is the potential basis of great scientific research work,” and indeed, it provides a clear idea of how the subtle mind may interact with the gross elements of the body and brain. In the theoretical structure of modern physics, however, there is at present no place for such a conception of the mind and the ethereal element (although some physicists have tentatively begun to entertain such ideas). As a consequence, scientists still generally adhere to the idea that it is impossible for the brain to interact with a distinct nonphysical mind. This in turn makes it impossible for them to give credence to many phenomena that imply the existence of such a mind, even though empirical evidence for these phenomena has existed for many years. These phenomena include the psychic events studied by the parapsychologists, out-of-body experiences, and the spontaneous remembrance of previous incarnations by small children. It is not our purpose here to make a case for the reality of such phenomena. Our main point is that it is very difficult for people (including scientists) to seriously contemplate particular ideas about reality unless those ideas fit neatly into a familiar and accepted conceptual system. The current theories of physics have been worked out in great technical detail, and one who lives in the conceptual universe these theories provide may find that the Vedic idea of ether seems crude and unimpressive. Openness to the Vedic ideas may also be blocked by certain misconceptions, such as the idea that ether must be like the “luminiferous ether” rejected by Einstein. Yet the possibility nonetheless exists that physical theory can be extended by introducing a new conception of the ether that agrees with the Vedic conception and is consistent with experimental observations. And such an extended theory may provide explanations for many phenomena presently considered scientifically impossible. Texts such as the Srimad-Bhagavatam were written for the purpose of clearly explaining certain spiritual ideas to people in general. However, they inevitably make reference to many other ideas that were familiar to people of the ancient Vedic culture but that may be very unfamiliar to people of modern Western background. One interesting example is the analogy given by Srila Sanatana Gosvami in which the transformation of a lowborn man into a brahmana is compared to the transformation of bell metal into gold by an alchemical process (Bhag. 5.24.17p). The alchemical process itself is not described, and on the basis of modern science we might tend to regard such a transformation as impossible. Yet the dictionary defines bell metal as an alloy of copper and tin, and if we consult the periodic table of the elements, we find that the atomic numbers of copper and tin added together give the atomic number of gold. This suggests that there just might be something to this example, but if so, it clearly involves an extensive body of practical and theoretical knowledge that is completely unknown to us. For Sanatana Goswami, however, this transformation simply provided a familiar example to illustrate a point about the spiritual transformation of human beings. Thus far, we have discussed Vedic references to phenomena and theoretical entities that do not fit into the rigorously defined theories of modern physics but that can be readily inserted into our ordinary picture of the world around us. In this book, however, we will be dealing with many things that do not seem to be at all compatible with that picture. We suggest that to accommodate these things, it is necessary for us to re-examine our basic ideas concerning the nature of space. Modern physics and astronomy began with the idea that matter is made of tiny bits of substance, each of which has a location in three-dimensional space. According to this idea, which was strongly developed by Descartes and Newton, three-dimensional space can be seen as an absolute, pre-existing container in which all material events take place. This idea is quite consistent with the picture of the world provided by our own senses, and it tends to provide an unquestioned background for all of our thinking. However, many cultures have maintained quite different ideas about the nature of space, and this is also true of the Vedic culture. I worship Govinda, the primeval Lord, whose transcendental form is full of bliss, truth, and substantiality and is thus full of the most dazzling splendor. Each of the limbs of that transcendental figure possesses in itself the full-fledged functions of all the organs, and He eternally sees, maintains, and manifests the infinite universes, both spiritual and mundane [Bs. 5.32]. He is an undifferentiated entity, as there is no distinction between the potency and the possessor thereof. In His work of creation of millions of worlds, His potency remains inseparable. All the universes exist in Him, and He is present in His fullness in every one of the atoms that are scattered throughout the universe, at one and the same time. Such is the primeval Lord whom I adore [Bs. 5.35]. These verses indicate that the form of Krishna is made of many parts, but that each part is identical to the whole. Also, all space is within the form of Krishna, but at the same time Krishna is fully present within every atom. One implication of this is that the entire universe, which is within Krishna, is fully present within every atom of the universe. Such a state of affairs cannot be visualized in three-dimensional terms, and indeed, it is not possible within three-dimensional space. The statement that reality is like this must simply be taken as an axiom describing the position of Krishna as the Supreme Absolute Truth. Thus, the Vedic concept of space begins with a statement of Krishna’s unified nature, rather than with the geometric axioms defining three-dimensional space. Here we will introduce an idea of higher-dimensional space that may help us understand the ideas about space implicit in the Vedic literature. The term higher-dimensional is borrowed from modern mathematics; it does not appear directly in Vedic literature. It is part of an attempt to bridge the conceptual gap between modern thinking and the Vedic world view. Naturally, since the traditional followers of Vedic culture have not been confronted with such a gap, they have not been motivated to introduce ideas to bridge it. The most fundamental feature of the Vedic idea of space is that many more things can be brought close together in this space than the geometric rules of three-dimensional space allow. In the course of this chapter we will give several examples from the Vedic literature illustrating this theme. Since the higher-dimensional spaces of mathematics also permit more things to be brought together than the rules of three-dimensional space allow, we have chosen the term higher-dimensional to refer to this feature of the Vedic view of reality. Although Krishna’s situation is very difficult for us to visualize, we can nonetheless understand from Vedic statements describing Krishna that space must be higher-dimensional. Krishna’s situation is that He has full access to every location simultaneously. In ordinary, three-dimensional space we have access, through the operation of our senses of action and perception, to locations within a limited neighborhood, and we can change that neighborhood by moving from one place to another. Thus our situation can be viewed as a restricted form of Krishna’s situation. A higher-dimensional space corresponds to a situation in which access between locations is more restricted than it is for Krishna but less restricted than it is for beings experiencing three-dimensional space. This concept of higher-dimensional space is closely tied together with the idea of varying levels of sensory development in sentient beings. Access between locations depends on the operation of senses of action and senses of perception, and thus it should be possible in principle to enlarge the space of one’s experience by increasing the scope of one’s sensory powers. Upon hearing this, Sri Krishna smiled and immediately meditated. Unlimited Brahmas arrived instantly. These Brahmas had different numbers of heads. Some had ten heads, some twenty, some a hundred, some a thousand, some ten thousand, some a hundred thousand, some ten million, and others a hundred million. No one can count the number of faces they had. There also arrived many Lord Shivas with various heads numbering one hundred thousand and ten million. Many Indras also arrived, and they had hundreds of thousands of eyes all over their bodies. When the four-headed Brahma of this universe saw all these opulences of Krishna, he became very bewildered and considered himself a rabbit among many elephants. All the Brahmas who came to see Krishna offered their respects at His lotus feet, and when they did this, their helmets touched His lotus feet. No one can estimate the inconceivable potency of Krishna. All the Brahmas who were there were resting in the one body of Krishna. When all the helmets struck together at Krishna’s lotus feet, there was a tumultuous sound. It appeared that the helmets themselves were offering prayers unto Krishna’s lotus feet. This is the proof of Dwaraka’s opulence: all the Brahmas thought, “Krishna is now staying in my jurisdiction.” Thus the opulence of Dvaraka was perceived by each and every one of them. Although they were all assembled together, no one could see anyone but himself. Lord Krishna then bade farewell to all the Brahmas there, and after offering their obeisances, they all returned to their respective homes [Cc. Madhya 21.65–80]. In this story it is significant that each of the Brahmas remained within his own universe. This means that Krishna was simultaneously manifesting His Dwaraka pastimes in all of those universes. Each Brahma except ours thought that he was alone with Krishna in Dwaraka within his own universe, but by Krishna’s grace our Brahma could simultaneously see all the others. This illustrates that Krishna has access to all locations at once, and it also shows that, by Krishna’s grace, different living beings can be given different degrees of spatial access, either permanently or temporarily. O best of the Bharatas, see here the different manifestations of Adityas, Vasus, Rudras, Ashvini-kumaras, and all the other demigods. Behold the many wonderful things that no one has ever seen or heard of before. O Arjuna, whatever you want to see, behold at once in this body of Mine! This universal form can show you whatever you now desire to see and whatever you may want to see in the future. Everything—moving and nonmoving—is here completely, in one place [Bg. 11.6–7]. Thus from one place Arjuna was able to see many different realms occupied by demigods and other kinds of living beings. To perceive such a vast variety of scenes simultaneously, Arjuna clearly had to transcend the limitations of three-dimensional space, and it is significant that Krishna made this possible through the medium of His all-pervading universal form. The story of mother Yashoda’s seeing the entire universe (including herself and Krishna) within Krishna’s mouth is another example showing that Krishna can reveal all locations through His all-encompassing form (see KB, pp. 83–84). It is interesting to note that the Brahmas visiting Krishna had varying numbers of heads, ranging from four to hundreds of millions. It is rather difficult to understand how millions of heads could be arranged on one body in three-dimensional space, and it is also difficult to see how millions of Brahmas could all be seen simultaneously within one room. We suggest that these things are made possible by the fact that the underlying space is not three-dimensional. Similar observations could be made about the incident in which Banasura used 1,000 arms to work 500 bows and shoot 2,000 arrows at a time at Krishna. In this case we are dealing with a materially embodied being living on the earth. One might wonder how 500 material arms could be mounted on one shoulder without interfering with one another. And if this is possible, how could they aim 500 bows in the same direction at once? (Did the bows pass through each other?) We suggest that stories of this kind implicitly require higher-dimensional conceptions of space. We can sum up the idea of dimensionality of space by saying that the greater the degree of access between locations, the higher the dimensionality of the space. Since Krishna has simultaneous access to all locations, He perceives space at the highest level of dimensionality. Different living beings will perceive space at different levels of dimensionality, and thus they will have access to different sets of locations (or lokas). It is interesting to note that the idea of higher-dimensional access between locations is a key feature of quantum mechanics. The quantum mechanical atom cannot be represented in three-dimensional space. In fact, to represent something as commonplace as an atom of carbon, quantum mechanics makes use of a kind of infinite-dimensional space called Hilbert space. The three-dimensional bonding of carbon and other atoms is made possible by the higher-dimensional interactions within the atoms. Thus, although the idea of higher-dimensional realms may seem to be an extreme departure from accepted scientific thinking, it is possible to interpret modern physics as laying the groundwork for such an idea. The eight mystic siddhis directly illustrate that sentient beings can operate at different levels of sensory power by being endowed to varying degrees with Krishna’s primordial potencies. Srila Prabhupada gives the following description of some of the mystic siddhis. A mystic yogi can enter into the sun planet simply by using the rays of the sunshine. This perfection is called laghima. Similarly, a yogi can touch the moon with his finger. Though the modern astronauts go to the moon with the help of spaceships, they undergo many difficulties, whereas a person with mystic perfection can extend his hand and touch the moon with his finger. This siddhi is called prapti, or acquisition. With this prapti-siddhi, not only can the perfect mystic yogi touch the moon planet, but he can extend his hand anywhere and take whatever he likes. He may be sitting thousands of miles away from a certain place, and if he likes he can take fruit from a garden there” [NOD, pp. 11–12]. “Now our Ph.D.’s must collaborate and study the Fifth Canto to make a model for building the Vedic Planetarium. My final decision is that the universe is just like a tree, with root upwards. Just as a tree has branches and leaves, so the universe is also composed of planets which are fixed up in the tree like the leaves, flowers, fruits, etc.…So now all you Ph.D.’s must carefully study the details of the Fifth Canto and make a working model of the universe. If we can explain the passing seasons, eclipses, phases of the moon, passing of day and night, etc., then it will be very powerful propaganda” (letter from Srila Prabhupada to Swarupa Damodara dasa, April 27, 1976). In the year A.D. 1068 a group of workmen labored to erect an earthen mound about sixty feet high in the Anglo-Saxon village of Cambridge, northeast of London. On top of this mound they built a stone tower that dominated the small collection of thatched houses huddled alongside the river Cam. This tower served as a fortress to protect and consolidate this part of the kingdom, which William the Conqueror had won just two years before. At this time the Western, or European, civilization, which is so important in the world today, was just beginning to emerge from the debris of previous cultures and societies. Science as we know it today was unheard of, and the Christian Church was in the process of solidifying its position in the previously pagan territories of northern Europe. The writings of the ancient Greeks and other early civilizations were largely lost, and would not be reintroduced into Europe from Arab sources for some three hundred years. Universities already existed in southern European countries; in Britain some two hundred years would pass before the founding of Oxford and then Cambridge. In A.D. 1000, about sixty years before the erection of the stone tower on the Cam, an Arab scholar named Alberuni completed a book on India (AL). Alberuni lived in the kingdom of Ghaznia, in the court of one King Mahmud-a Muslim king who specialized in raiding the northwestern territories of India, such as Sind and the Punjab. Alberuni was a well-known scholar of his time who read Plato in the original Greek and who had also studied Sanskrit. He was apparently employed by King Mahmud to study the Hindus, in much the same way that the United States government now employs scholars to study the Russians and the Communist Chinese. Alberuni’s access to source material in Sanskrit was limited. He had access to the body of Indian astronomical literature called jyotisha shastra, and he also had access to a number of Puranas, such as the Matsya Purana and the Vayu Purana. He mentions the Srimad-Bhagavatam, or Bhagavata Purana, but apparently he never saw a copy of it. In this body of literature, Alberuni was mainly interested in information relating to the Indian view of the universe and the observable material events taking place within it. Indeed, the most striking feature of Alberuni’s book is that nearly half of it is concerned with Indian astronomy and cosmology. One important division of the jyotisha shastra consists of works on mathematical astronomy known as astronomical siddhantas. These include works of historical Indian astronomers, such as Aryabhata, Brahmagupta, and Viraha Mihira, some of whom were nearly Alberuni’s contemporaries. They also include ancient Sanskrit texts, such as the Surya-siddhanta, that were said to have been originally disseminated by demigods and great rishis. These works treat the earth as a small globe floating in space and surrounded by the planets, which orbit around it. They are mainly concerned with the question of how to calculate the positions of the planets in the sky at any desired time. They contain elaborate rules for performing these calculations, as well as much numerical data concerning the distances, sizes, and rates of motion of the planets. However, they say very little about the nature of the planets, their origin, and the causes of their motion. The calculations described in the astronomical siddhantas were well understood by Alberuni, and it seems that at that time there was considerable interest in Indian astronomy in the centers of Muslim civilization. He was also familiar with the Greek astronomical tradition, epitomized by Ptolemy. However, Alberuni found the cosmology presented in the Puranas very hard to understand. His account of Puranic cosmology closely follows the Fifth Canto of the Srimad-Bhagavatam, and the Puranas in general. When dealing with this material, Alberuni frequently expressed exasperation and complete incomprehension, much as many people do today, and he naturally took this as an opportunity to criticize Hindu dharma and assert the superiority of his own Muslim tradition. In this book we will discuss the cosmology presented in the Fifth Canto of the Srimad-Bhagavatam and try to clarify its relationship with other prominent systems of cosmology, both ancient and modern. We have begun with this historical account to show that bewilderment with the cosmology of the Bhagavatam is not a new phenomenon caused by the rise of modern science. The same bewilderment also affected Alberuni, even though in his society the earth was regarded as being fixed in the center of the universe. Many Indian astronomers of earlier centuries were also unable to understand Vedic cosmology, and they were led to openly reject parts of it, even though their own religious and social tradition was based on the Puranas. For example, Bhaskaracharya, the 11th-century author of the siddhantic text Siddhanta-shiromani, could not reconcile the relatively small diameter of the earth, which he deduced from simple measurements, with the immense magnitude attributed to the earth by the Pauranikas, the followers of the Puranas (SSB1, pp. 114–15). Likewise, the 15th-century south Indian astronomer Parameshvara stated that the Puranic account of the seven dvipas and oceans is something “given only for religious meditation,” and that the 84,000-yojana height of Mount Meru described in the Puranas is “not acceptable to the astronomers” (GP, pp. 85, 87). Vaishnavas of past centuries also discussed the relationship between the Fifth Canto of Srimad-Bhagavatam and the jyotisha shastras. An example of this is found in the Bhagavatam commentary of Vamshidhara, a Vaishnava who lived in the 17th century A.D. In this commentary, Vamshidhara discusses the apparent conflict between the small size of the earth, as described in the jyotisha shastras, and the large size of Bhu-mandala, as described in the Fifth Canto. His analysis of this apparent conflict is discussed in Appendix 1. There are evidently serious disagreements between the cosmological system of the Puranas and the world models that human observers tend to arrive at using their reasoning powers and their ordinary senses. The cause of these difficulties is not simply the rise of modern Western science. They have existed in India since a time antedating the rise of modern Western culture, and to some they may seem to be based on an inherent contradiction within the Vedic tradition itself. The long-standing perplexity that has attended the subject of Vedic cosmology indicates that these disagreements are very deep and difficult to resolve. However, the thesis of this book is that the disagreements are not irreconcilable. The apparent contradictions can be resolved by developing a proper understanding of the nature of space, time, and matter, as described in the Srimad-Bhagavatam, and a corresponding understanding of the Vedic approach to describing and thinking about reality. Our thesis is that the astronomical siddhantas and the Puranic cosmology can be understood as mutually compatible accounts of one multifaceted material reality. Modern Western science is based on the idea that nature can be fully described by a single, rational world-model. However, the Srimad-Bhagavatam points out that no person of this world is capable of fully describing the material universe “even in a lifetime as long as that of Brahma” (Bhag. 5.16.4). Thus the Vedic approach to the description of nature is based on the strategy of presenting many mutually compatible aspects of one humanly indescribable complete whole. The old story of the blind men and the elephant epitomizes this approach. Each blind man observed a genuine aspect of the elephant, and a seeing man could understand how all of these aspects fit together to form a coherent whole. Even a blind man, after carefully studying the reports coming from the seeing man and his fellow blind men, could begin to understand the nature of the whole elephant, although he could not directly sense it without obtaining a cure for his blindness. We suggest that in our attempts to understand the material universe, we are comparable to a blind man feeling a particular part of the elephant. According to this analogy, the astronomical siddhantas present the cosmos as it appears to similar blind men of this earth, and literatures such as the Bhagavatam present the world view of beings with higher powers of vision. These include demigods, rishis, and ultimately the Supreme Lord, who alone can see the entire universe. These higher beings can directly see both the aspects of the universe presented in the Bhagavatam and the aspects presented in the astronomical siddhantas. To these higher beings it is apparent how all of these aspects fit together consistently in a complete whole, even though we can begin to understand this only with great effort. We note that with the development of modern physics, scientists have at least temporarily been forced to abandon the goal of formulating one complete mathematical model of the atom. According to the standard interpretation of the quantum theory introduced by Niels Bohr, atomic phenomena must be understood from at least two complementary perspectives rather than as a single, intelligible whole. These perspectives-the wave picture and the particle picture-seem to contradict each other, and yet they are both valid descriptions of nature. They are facets of a coherent theory of the atom, but they cannot be combined within the framework of classical physics. To unite them and show their compatibility, one must go to a higher-dimensional level of mathematical abstraction, which is very difficult to comprehend. In developing an understanding of Vedic cosmology as a multifaceted description of reality, it will be necessary to free ourselves from the rigid framework of Cartesian and Euclidian three-dimensional geometry, which forms the basis of the modern scientific world view. We will attempt to do this in Chapter 2, where we will discuss space, physical laws, and processes of sense perception, as presented in the Srimad-Bhagavatam. In Chapters 3 and 4 we will give an account of Puranic cosmology and show how the ideas developed in Chapter 2 can be applied to resolve apparent contradictions within the Vedic tradition and between the Vedic cosmology and the world of our ordinary sensory experience. Here a key idea is that the universe as described in Vedic literature is higher-dimensional: it cannot be fully represented within three-dimensional space. In our discussion of Vedic cosmology we will be forced to interpret the texts of the Srimad-Bhagavatam and other Vedic literature. This is inevitable, since even a literal interpretation is based on underlying assumptions made by the reader—assumptions that may differ from those of the author of the text, and that the reader may hold without being consciously aware of them. In making such interpretations we will try to adhere to the following rule given by Srila Prabhupada: “The original purpose of the text must be maintained. No obscure meaning should be screwed out of it, yet it should be presented in an interesting manner for the understanding of the audience. This is called realization” (Bhag. 1.4.1p). We also note that Srila Prabhupada advocated in Bhag. 5.16.10p that we should accept the cosmological statements in the Srimad-Bhagavatam as authoritative and simply try to appreciate them. We will therefore adopt the working assumption that even though these statements may seem very hard to comprehend, they nonetheless do present an understandable and realistic description of the universe. In Chapter 5 we address the question of whether or not there is any empirical evidence supporting the higher-dimensional picture of the universe that we derive from the Srimad-Bhagavatam. It turns out that there is voluminous evidence along these lines, although practically none of it is accepted by the scientific community. In Chapter 6 we return to Vedic cosmology and discuss a number of controversial topics, including gravitation, the moon flight, the scale of cosmic distances, and the nature of stars. In Chapter 7 we survey the modern scientific evidence regarding the theory of the expanding universe. Here we not only find that this theory is flawed, but we also find evidence indicating that Newton’s laws of motion fail on the galactic level. Finally, in Chapter 8 we present brief answers to a number of common questions. The material presented in this book constitutes a preliminary study of Vedic cosmology and astronomy. To properly answer the many questions that arise, much further research will have to be done. This will include (1) careful study of cosmological material in a wide variety of Vedic literatures, (2) study of Vedic geographical material, (3) careful analysis of the theories of Western scholars about the history of Vedic astronomy, (4) study of ancient astronomical observations, (5) study of dating and the Vedic calendar, (6) study of empirical evidence relating to Vedic cosmology, and (7) the careful analysis of modern cosmology and astronomy. It is our hope that these studies will culminate in the development of a Vedic planetarium and museum that can effectively present Krishna consciousness in the context of Vedic cosmology. This, of course, was Srila Prabhupada’s plan for the planetarium in the Temple of Understanding in Sridhama Mayapura, and similar planetariums can be set up in cities around the world. In this book we will use the terms Vedic and Puranic interchangeably. Although modern scholars reject this usage, it is justified by the verse itihasa-puranam ca pancamo veda ucyate in Srimad-Bhagavatam (1.4.20). According to this verse, the Puranas and the histories, such as the Mahabharata, are known as the fifth Veda. References to Sanskrit and Bengali texts are of three forms: A reference such as Bhag. 5.22.14 means that the quotation is from the 14th verse of Chapter 22 of the Fifth Canto of Srimad-Bhagavatam. A reference such as Bhag. 5.21.6p means the quotation is from Srila Prabhupada’s purport to verse 6 of Chapter 21 of the Fifth Canto. And a reference such as Bhag. 5.21cs means the quotation is from the Chapter Summary of Chapter 21 of the Fifth Canto. AL or ML after references to the Chaitanya-charitamrita indicate Adi-lila or Madhya-lila. For books not divided into verses and purports, we cite the code identifying the book, followed by the page number (see the Bibliography). The mysteries of the Fifth Canto of the Srimad-Bhagavatam have long puzzled student of Vedic cosmography and astronomy. Confronted with a description of the universe that seems much at variance with the information provided by our sense and standard astronomical calculations, foreign observers—and even Indian commentators—from the Middles Ages up to the present have concluded that the Bhagavatam’s account, elaborated in other Puranas, must be mythological. On the other hand, the same persons have been much impressed with Vedic astronomical treatises, the jyotisha-shastras, which provide remarkably accurate measurements of the solar system. 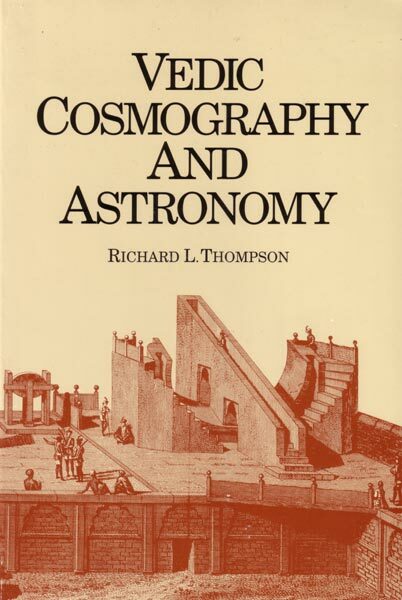 In Vedic Cosmography and Astronomy, Dr. Richard Thompson shows that the Fifth Canto’s cosmography and the accounts of the solar system found in the jyotisha-shastras are not contradictory, but that they in fact represent distinct yet mutually consistent ways of comprehending a universe with important features beyond the range of ordinary sense perception.